By adding hydrolytic enzymes to the feedstock, plant polymers (cellulose, hemicellulose, etc.) are broken down to their sugar monomers which are then available for fermentation. The hydrolysis of cellulose is challenging due to its recalcitrant character. Further optimisation of this step is necessary in order to increase sugar yields and process efficiency while minimising enzyme consumption and costs. Hydrolysis of cellulose and hemicelluloses yields a variety of sugars of which glucose and xylose are most important. Yeast (Saccharomyces cerevisiae) is then used to ferment these sugars to ethanol. In order to maximise the efficiency of the overall process, the fermentation of both glucose and xylose is desirable. In the BIOLYFE project, the yeasts are able to co-ferment glucose and xylose at the same time. 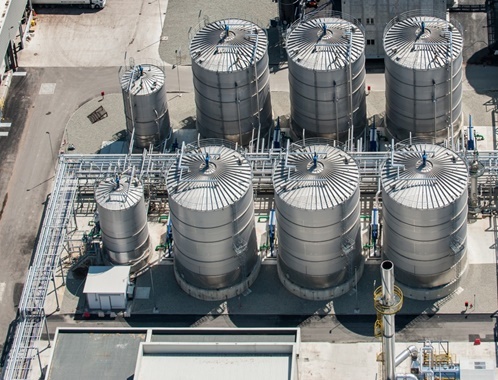 Hydrolysis and fermentation are often run separately, but simultaneous saccharification (= hydrolysis) and fermentation (SSF) offers the opportunity to reduce both the overall complexity of the process and capital costs. In addition, the immediate utilisation of hydrolysis products (i.e. sugars) prevents inhibition of enzyme activity through product accumulation. In BIOLYFE, a pre-hydrolysis step is applied before the feedstock is treated in a SSF reactor where the hydrolysis is completed and sugars are fermented at the same time.